This Americase Ultra-Lite Series is designed for a Custom Compact. It is a single barrel breakdown case that weighs at least 1/3 less than our Premium Series cases. 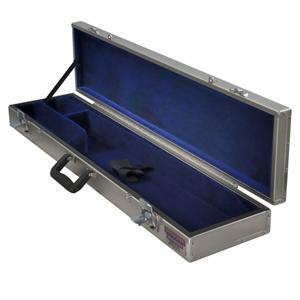 This is a simple yet very practical case that can hold a standard or sub gauge shotgun. The stock is secured by a grip strap and there are compartments for the fore-arm, stock, barrel and a storage/tool area. This 3017 comes with two heavy duty key-lockable latches, and two eyelets that may be padlocked. As with all of our cases this meets airport security guidelines. Ext Dim: 34 3/4" x 8 1/2" x 3 1/2"
BBl Slot: 33 1/4" x 2 3/8"
LH Storage: 7" x 2 5/8" x 2 1/2"
Fore-End: 11 3/4 x 1 7/8" x 2 3/8"
Stock Size: 23" x 6 1/4" x 2 1/4"